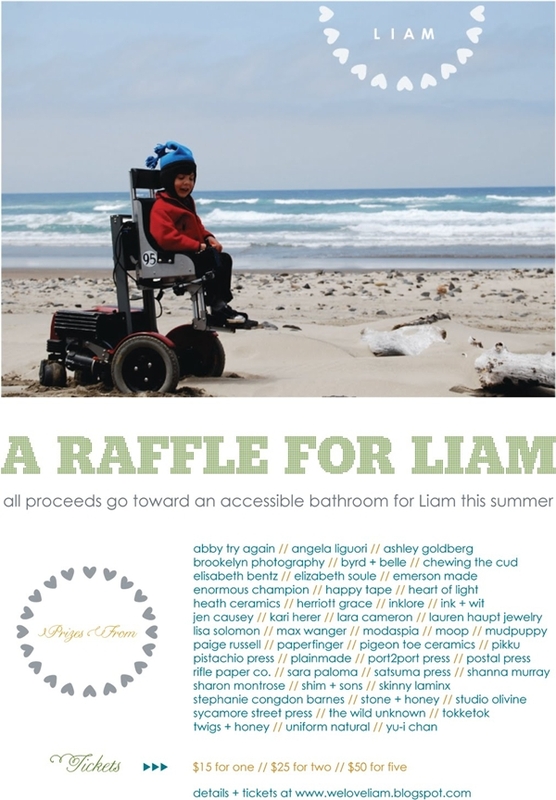 Please consider participating in this raffle for Liam! Lynn Russell, the designer and printer behind Satsuma Press, is raising money for her son, Liam, who turns 6 today! He has a neuromuscular disorder called Spinal Muscular Atrophy Type 2 and his family needs to make an accessible bathroom for him this summer. There are great prizes from over 50 artists and it's for a great cause! Tickets are priced at $15 for one // $25 for two // $50 for five. The raffle runs through May 9. Click on the poster below to participate! I stumbled on your blog from a Supermarket HQ retweet of your planters and was touched by this raffle. Thanks for posting it! It's a great cause and it seems like everyone involved is really sweet and earnest in their support. I love seeing positive solutions to problems that can seem insurmountable. I hope the Russells are able to raise the funds they need! Thanks for your kind words Ellen! We have been long time admirers of Lynn and all of the participating artists and are just glad we could help spread the word.